Youssef Aït Bennasser is one of the Verts! Home > News> Youssef Aït Bennasser is one of the Verts! The International Moroccan defensive midfielder has officially joined AS Saint-Étienne. He signed with the club in the form of a loan without the option of contract purchase, until the end of the season. This Thursday, Youssef Aït Bennasser officially became AS Saint-Etienne’s seventh International recruit since January 2018. 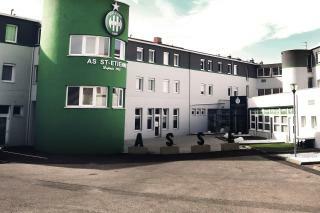 ASSE and AS Monaco have in fact come to an agreement for the loan without option of contract purchase of the young Moroccan (22-years old), who will wear ASSE’s colours until the end of the season. Youssef Aït Bennasser was born in Toul in Meurthe-et-Moselle. It was in the leading club of his department of origin, AS Nancy-Lorraine, that he completed his training. With AS Nancy-Lorraine, he played his first professional match in the Domino’s Ligue 2 championship, August 3rd, 2015, against Tours (0-0). He was only 19-years old. He participated in 33 championship matches during the 2015-2016 season, after which he won the title of Domino’s Ligue 2 champion with ASNL. During the summer of 2016, he joined AS Monaco for 5 years who loaned him immediately to AS Nancy-Lorraine, where he played his first Ligue 1 Conforama championship match August 14th, 2016, at 20-years of age. His performances with his training club were followed by Hervé Renard, Marocco’s manager, who selected him for the first time, during a friendly match, against Albania August 31st, 2016. Youssef then participated in 16 other matches with the Lions de l’Atlas and counted himself among the 23 Moroccans selected for the 2018 World Cup in Russia. During the 2017-2018 Youssef realized his potential. Wearing the colours of the Stade Malherbe de Caen, where Monaco loaned him, he played 34 matches in the Ligue 1 Conforama championship. He returned to Monaco last summer to impose himself on the home turf of the vice-champion of France. He played 13 championship matches there and 2 Champions League matches. Right-handed, Youssef Aït Bennasser is a versatile defensive midfielder, comfortable on a technical level, who will bring to ASSE his freshness and his experience. At 22-years of age, he’s about to celebrate his 100th professional match. He will wear the number 8. > Frédéric Paquet (General Manager): "Our desire was to recruit a midfielder who could start right away. Youssef Aït Benasser is a young player who possess solid experience in the Ligue 1 Conforama Championship. With AS Monaco and Morocco, he had the chance to discover the very high demands of the highest level of Football. We’re counting on his many physical qualities and his desire to progress. 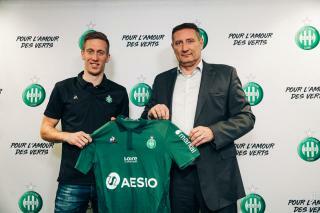 Robert Beric prolongs his adventure ! 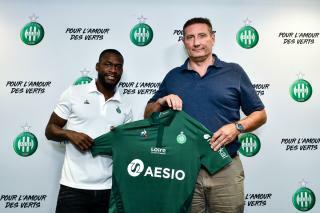 Yannis Salibur, last reinforcement !